This article is about the third-century Roman emperor. For other uses, see Aurelian (disambiguation). Not to be confused with Marcus Aurelius. Aurelian (Latin: Lucius Domitius Aurelianus Augustus;[a] 9 September 214 or 215 – September or October 275) was Roman Emperor from 270 to 275. Born in humble circumstances, he rose through the military ranks to become emperor. During his reign, he defeated the Alamanni after a devastating war. He also defeated the Goths, Vandals, Juthungi, Sarmatians, and Carpi. Aurelian restored the Empire's eastern provinces after his conquest of the Palmyrene Empire in 273. The following year he conquered the Gallic Empire in the west, reuniting the Empire in its entirety. He was also responsible for the construction of the Aurelian Walls in Rome, and the abandonment of the province of Dacia. Freedwoman of the clan Aurelius and Priestess of Sol Invictus in her native village. Bust of a Roman Emperor usually thought of as a bust of Claudius II, however there is a possibility that this bust is actually the bust of Aurelian, since the Roman who buried this would have probably buried a statue of Aurelian along with Claudius II and the other busts found in the Brescia temple. Features of the statue do match the face of Aurelian depicted on coins. His successes were instrumental in ending the Roman Empire's Crisis of the Third Century, earning him the title Restitutor Orbis or "Restorer of the World". Although Domitian was the first emperor who had demanded to be officially hailed as dominus et deus (master and god), these titles never occurred in written form on official documents until the reign of Aurelian. Aurelian was born on 9 September, most likely in 214 AD, although 215 AD is also possible. The ancient sources do not agree on his place of birth, although he was generally accepted as being a native of Illyricum but, another common belief was that he was born in Greece. Sirmium in Pannonia Inferior (now Sremska Mitrovica, Serbia) is the preferred location, which was created by Aurelian as Emperor when he abandoned the old trans-Danubian territory of Dacia. The academic consensus is that he was of humble birth and that his father was a peasant-farmer who took his Roman nomen from his landlord, a senator of the clan Aurelius. Saunders suggests that his family might in fact have been of Roman settler origin and of much higher social status; however, his suggestion has not been taken up by his more recent academic colleagues such as Southern and Watson. Using the evidence of the ancient sources, it was at one time suggested that Aurelian's mother was a freedwoman of a member of the clan Aurelius and that she herself was a priestess of the Sun-God in her native village. These two propositions, together with the tradition that the clan Aurelius had been entrusted with the maintenance of that deity's cult in Rome, inspired the notion that this could explain the devotion to the sun-god that Aurelian was to manifest as Emperor - see below. However, it seems that this pleasant extrapolation of dubious facts is now generally accepted as being no more than just that. It is commonly accepted that Aurelian probably joined the army in 235 AD at around age twenty. It is also generally assumed that, as a member of the lowest rank of society—albeit a citizen[b]—he would have enlisted in the ranks of the legions. Saunders suggests that his career is more easily understood if it is assumed that his family was of Roman settler origins with a tradition of military service and that he enlisted as an equestrian. This would have opened up for him the tres militia—the three steps of the equestrian military career—one of the routes to higher equestrian office in the Imperial Service. [c] This could be a more expeditious route to senior military and procuratorial offices than that pursued by ex-rankers, although not necessarily less laborious. [d] However, Saunders's conjecture as to Aurelian's early career is not supported by any evidence other than his nomen which could indicate Italian settler ancestry—although even this is contested—and his rise to the highest ranks which is more easily understood if he did not have to start from the bottom. His suggestion has not been taken up by other academic authorities. Whatever his origins, Aurelian certainly must have built up a very solid reputation for military competence during the tumultuous mid-decades of the century. To be sure, the exploits detailed in the Historia Augusta vita Divi Aureliani, while not always impossible, are not supported by any independent evidence and one at least is demonstrably an invention typical of that author. However, he was probably associated with Gallienus's cavalry army and shone as an officer of that corps d'élite because, when he finally emerged in a historically reliable context in the early part of the reign of Claudius II, he seems to have been its commander. His successes as a cavalry commander ultimately made him a member of emperor Gallienus' entourage. In 268, Aurelian and his cavalry participated in general Claudius' victory over the Goths at the Battle of Naissus. Later that year Gallienus traveled to Italy and fought Aureolus, his former general and now usurper for the throne. Driving Aureolus back into Mediolanum, Gallienus promptly besieged his adversary in the city. However, while the siege was ongoing the Emperor was assassinated. One source says Aurelian, who was present at the siege, participated and supported general Claudius for the purple—which is plausible. Aurelian was married to Ulpia Severina, about whom little is known. Like Aurelian she was from Dacia. They are known to have had a daughter together. Claudius was acclaimed Emperor by the soldiers outside Mediolanum. The new Emperor immediately ordered the senate to deify Gallienus. Next, he began to distance himself from those responsible for his predecessor's assassination, ordering the execution of those directly involved. Aureolus was still besieged in Mediolanum and sought reconciliation with the new emperor, but Claudius had no sympathy for a potential rival. The emperor had Aureolus killed and one source implicates Aurelian in the deed, perhaps even signing the warrant for his death himself. During the reign of Claudius, Aurelian was promoted rapidly: he was given command of the elite Dalmatian cavalry, and was soon promoted to overall Magister equitum, effectively the head of the army after the Emperor – and the Emperor Claudius' own position before his acclamation. The war against Aureolus and the concentration of forces in Italy allowed the Alamanni to break through the Rhaetian limes along the upper Danube. Marching through Raetia and the Alps unhindered, they entered northern Italy and began pillaging the area. In early 269, emperor Claudius and Aurelian marched north to meet the Alamanni, defeating them decisively at the Battle of Lake Benacus. While still dealing with the defeated enemy, news came from the Balkans reporting large-scale attacks from the Heruli, Goths, Gepids, and Bastarnae. Claudius immediately dispatched Aurelian to the Balkans to contain the invasion as best he could until Claudius could arrive with his main army. The Goths were besieging Thessalonica when they heard of emperor Claudius' approach, causing them to abandon the siege and pillage north-eastern Macedonia. Aurelian intercepted the Goths with his Dalmatian cavalry and defeated them in a series of minor skirmishes, killing as many as three thousand of the enemy. Aurelian continued to harass the enemy, driving them northward into Upper Moesia where emperor Claudius had assembled his main army. The ensuing battle was indecisive: the northward advance of the Goths was halted but Roman losses were heavy. Claudius could not afford another pitched battle, so he instead laid a successful ambush, killing thousands. However, the majority of the Goths escaped and began retreating south the way they had come. For the rest of year, Aurelian harassed the enemy with his Dalmatian cavalry. Now stranded in Roman territory, the Goths' lack of provisions began to take its toll. Aurelian, sensing his enemies' desperation, attacked them with the full force of his cavalry, killing many and driving the remainder westward into Thrace. As winter set in, the Goths retreated into the Haemus Mountains, only to find themselves trapped and surrounded. The harsh conditions now exacerbated their shortage of food. However, the Romans underestimated the Goths and let their guard down, allowing the enemy to break through their lines and escape. Apparently emperor Claudius ignored advice, perhaps from Aurelian, and withheld the cavalry and sent in only the infantry to stop their break-out. The determined Goths killed many of the oncoming infantry and were only prevented from slaughtering them all when Aurelian finally charged in with his Dalmatian cavalry. The Goths still managed to escape and continued their march through Thrace. The Roman army continued to follow the Goths during the spring and summer of 270. Meanwhile, a devastating plague swept through the Balkans, killing many soldiers in both armies. Emperor Claudius fell ill on the march to the battle and returned to his regional headquarters in Sirmium, leaving Aurelian in charge of operations against the Goths. Aurelian used his cavalry to great effect, breaking the Goths into smaller groups which were easier to deal with. By late summer the Goths were defeated: any survivors were stripped of their animals and booty and were levied into the army or settled as farmers in frontier regions. Aurelian had no time to relish his victories; in late August news arrived from Sirmium that emperor Claudius was dead. When Claudius died, his brother Quintillus seized power with support of the Senate. With an act typical of the Crisis of the Third Century, the army refused to recognize the new Emperor, preferring to support one of its own commanders: Aurelian was proclaimed emperor in September 270 by the legions in Sirmium. Aurelian defeated Quintillus' troops, and was recognized as Emperor by the Senate after Quintillus' death. The claim that Aurelian was chosen by Claudius on his death bed can be dismissed as propaganda; later, probably in 272, Aurelian put his own dies imperii the day of Claudius' death, thus implicitly considering Quintillus a usurper. With his base of power secure, he now turned his attention to Rome's greatest problems—recovering the vast territories lost over the previous two decades, and reforming the res publica. In 248, Emperor Philip the Arab had celebrated the millennium of the city of Rome with great and expensive ceremonies and games, and the Empire had given a tremendous proof of self-confidence. In the following years, however, the Empire had to face a huge pressure from external enemies, while, at the same time, dangerous civil wars threatened the empire from within, with usurpers weakening the strength of the state. Also, the economic substrate of the state, agriculture and commerce, suffered from the disruption caused by the instability. On top of this an epidemic swept through the Empire around 250, greatly diminishing manpower both for the army and for agriculture. The end result was that the Empire could not endure the blow of the capture of Emperor Valerian in 260 by the Sassanids. The eastern provinces found their protectors in the rulers of the city of Palmyra, in Syria, whose autonomy grew until the formation of the Palmyrene Empire, which was successful in defending against the Sassanid threat. The western provinces, those facing the limes of the Rhine, seceded to form a third, autonomous state within the territories of the Roman Empire, which is now known as the Gallic Empire. In Rome, the Emperor was occupied with internal menaces to his power and with the defense of Italia and the Balkans. The first actions of the new Emperor were aimed at strengthening his own position in his territories. Late in 270, Aurelian campaigned in northern Italia against the Vandals, Juthungi, and Sarmatians, expelling them from Roman territory. To celebrate these victories, Aurelian was granted the title of Germanicus Maximus. The authority of the Emperor was challenged by several usurpers — Septimius, Urbanus, Domitianus, and the rebellion of Felicissimus — who tried to exploit the sense of insecurity of the empire and the overwhelming influence of the armies in Roman politics. Aurelian, being an experienced commander, was aware of the importance of the army, and his propaganda, known through his coinage, shows he wanted the support of the legions. The Porta Asinara, a gate in the Aurelian Walls. The burden of the northern barbarians was not yet over, however. In 271, the Alamanni moved towards Italia, entering the Po plain and sacking the villages; they passed the Po River, occupied Placentia and moved towards Fano. Aurelian, who was in Pannonia to control the Vandals' withdrawal, quickly entered Italia, but his army was defeated in an ambush near Placentia (January 271). When the news of the defeat arrived in Rome, it caused great fear for the arrival of the barbarians. But Aurelian attacked the Alamanni camping near the Metaurus River, defeating them in the Battle of Fano, and forcing them to re-cross the Po river; Aurelian finally routed them at Pavia. For this, he received the title Germanicus Maximus. However, the menace of the Germanic people and a Germanic invasion was still perceived by the Romans as likely, so Aurelian resolved to build a new system of walls around Rome that became known as the Aurelian Walls. The emperor led his legions to the Balkans, where he defeated and routed the Goths beyond the Danube, killing the Gothic leader Cannabaudes, and assuming the title of Gothicus Maximus. However, he decided to abandon the province of Dacia, on the exposed north bank of the Danube, as too difficult and expensive to defend. He reorganized a new province of Dacia south of the Danube, inside the former Moesia, called Dacia Aureliana, with Serdica as the capital. 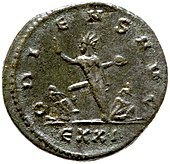 Aurelian, personification of Sol, defeats the Palmyrene Empire, and celebrates ORIENS AVG – oriens Augusti: the rising sun/star of Augustus. Legend: IMP. AVRELIANVS AVG. / ORIENS AVG. - XIR. The route of Aurelian's campaign against Palmyra. In 272, Aurelian turned his attention to the lost eastern provinces of the empire, the so-called "Palmyrene Empire" ruled by Queen Zenobia from the city of Palmyra. Zenobia had carved out her own empire, encompassing Syria, Palestine, Egypt and large parts of Asia Minor. The Syrian queen cut off Rome's shipments of grain, and in a matter of weeks, the Romans started running low on bread. In the beginning, Aurelian had been recognized as Emperor, while Vaballathus, the son of Zenobia, held the title of rex and imperator ("king" and "supreme military commander"), but Aurelian decided to invade the eastern provinces as soon as he felt his army to be strong enough. Asia Minor was recovered easily; every city but Byzantium and Tyana surrendered to him with little resistance. The fall of Tyana lent itself to a legend: Aurelian to that point had destroyed every city that resisted him, but he spared Tyana after having a vision of the great 1st-century philosopher Apollonius of Tyana, whom he respected greatly, in a dream. Apollonius implored him, stating, "Aurelian, if you desire to rule, abstain from the blood of the innocent! Aurelian, if you will conquer, be merciful!" Whatever the reason, Aurelian spared Tyana. It paid off; many more cities submitted to him upon seeing that the Emperor would not exact revenge upon them. Within six months, his armies stood at the gates of Palmyra, which surrendered when Zenobia tried to flee to the Sassanid Empire. The "Palmyrene Empire" was no more. Eventually Zenobia and her son were captured and made to walk on the streets of Rome in his triumph, the woman in golden chains. With the grain stores once again shipped to Rome, Aurelian's soldiers handed out free bread to the citizens of the city, and the Emperor was hailed a hero by his subjects. After a brief clash with the Persians and another in Egypt against the usurper Firmus, Aurelian was obliged to return to Palmyra in 273 when that city rebelled once more. This time, Aurelian allowed his soldiers to sack the city, and Palmyra never recovered. More honors came his way; he was now known as Parthicus Maximus and Restitutor Orientis ("Restorer of the East"). The rich province of Egypt was also recovered by Aurelian. The Brucheion (Royal Quarter) in Alexandria was burned to the ground. This section of the city once contained the Library of Alexandria, although the extent of the surviving Library in Aurelian's time is uncertain. In 274, the victorious emperor turned his attention to the west, and the "Gallic Empire" which had already been reduced in size by Claudius II. 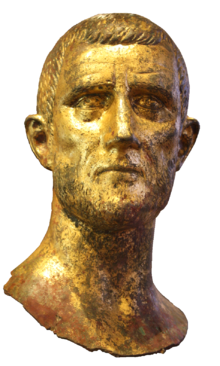 Aurelian won this campaign largely through diplomacy; the "Gallic Emperor" Tetricus was willing to abandon his throne and allow Gaul and Britain to return to the Empire, but could not openly submit to Aurelian. Instead, the two seem to have conspired so that when the armies met at Châlons-en-Champagne that autumn, Tetricus simply deserted to the Roman camp and Aurelian easily defeated the Gallic army facing him. Tetricus was rewarded for his part in the conspiracy with a high-ranking position in Italy itself. A Radiate of Aurelian, obverse. Legend: IMP. AVRELIANVS AVG. A Radiate of Aurelian, reverse. Legend: ORIENS AVG. - EXXI. Aurelian returned to Rome and won his last honorific from the Senate – Restitutor Orbis ("Restorer of the World"). This title was first assumed by Aurelian in late summer of 272, and had been carried previously by both Valerian and Gallienus. In four years, Aurelian had secured the frontiers of the Empire and reunified it, effectively giving the Empire a new lease on life that lasted 200 years. Aurelian was a reformer, and settled many important functions of the imperial apparatus, dealing with the economy and religion. He restored many public buildings, re-organized the management of the food reserves, set fixed prices for the most important goods, and prosecuted misconduct by the public officers. Aurelian strengthened the position of the Sun god Sol Invictus as the main divinity of the Roman pantheon. His intention was to give to all the peoples of the Empire, civilian or soldiers, easterners or westerners, a single god they could believe in without betraying their own gods. The center of the cult was a new temple, built in 274 and dedicated on December 25 of that year in the Campus Agrippae in Rome, with great decorations financed by the spoils of the Palmyrene Empire. During his short rule, Aurelian seemed to follow the principle of "one faith, one empire", which would not be made official until the Edict of Thessalonica. He appears with the title deus et dominus natus ("God and born ruler") on some of his coins, a style also later adopted by Diocletian. Lactantius argued that Aurelian would have outlawed all the other gods if he had had enough time. He was recorded by Christian historians as having organized persecutions. Aurelian's reign records the only uprising of mint workers. The rationalis Felicissimus, a senior public financial official whose responsibilities included supervision of the mint at Rome, revolted against Aurelian. The revolt seems to have been caused by the fact that the mint workers, and Felicissimus first, were accustomed to stealing the silver for the coins and producing coins of inferior quality. Aurelian wanted to eliminate this, and put Felicissimus on trial. The rationalis incited the mintworkers to revolt: the rebellion spread in the streets, even if it seems that Felicissimus was killed immediately, presumably executed. The Palmyrene rebellion in Egypt had probably reduced the grain supply to Rome, thus disaffecting the population to the emperor. This rebellion also had the support of some senators, probably those who had supported the election of Quintillus, and thus had something to fear from Aurelian. Aurelian ordered the urban cohorts, reinforced by some regular troops of the imperial army, to attack the rebelling mob: the resulting battle, fought on the Caelian hill, marked the end of the revolt, even if at a high price (some sources give the figure, probably exaggerated, of 7,000 casualties). Many of the rebels were executed; also some of the supporting senators were put to death. The mint of Rome was closed temporarily, and the institution of several other mints caused the main mint of the empire to lose its hegemony. His monetary reformation included the introduction of antoniniani containing 5% silver. They bore the mark XXI (or its Greek numerals form KA), which meant that twenty of such coins would contain the same silver quantity of an old silver denarius. [e] Considering that this was an improvement over the previous situation gives an idea of the severity of the economic situation Aurelian faced. The Emperor struggled to introduce the new "good" coin by recalling all the old "bad" coins prior to their introduction. A very large number of rare gold coins of Aurelian have been discovered as part of the Lava Treasure in Corsica, France, in the 1980s. In 275, Aurelian marched towards Asia Minor, preparing another campaign against the Sassanids: the deaths of Kings Shapur I (272) and Hormizd I (273) in quick succession, and the rise to power of a weakened ruler (Bahram I), presented the opportunity to attack the Sassanid Empire. On his way, the Emperor suppressed a revolt in Gaul — possibly against Faustinus, an officer or usurper of Tetricus — and defeated barbarian marauders in Vindelicia (Germany). However, Aurelian never reached Persia, as he was murdered while waiting in Thrace to cross into Asia Minor. As an administrator, Aurelian had been very strict and handed out severe punishments to corrupt officials or soldiers. A secretary of Aurelian (called Eros by Zosimus) had told a lie on a minor issue. In fear of what the Emperor might do, he forged a document listing the names of high officials marked by the emperor for execution and showed it to collaborators. The notarius Mucapor and other high-ranking officers of the Praetorian Guard, fearing punishment from the Emperor, murdered him in September 275, in Caenophrurium, Thrace (modern Turkey). Aurelian's enemies in the Senate briefly succeeded in passing damnatio memoriae on the Emperor, but this was reversed before the end of the year and Aurelian, like his predecessor Claudius II, was deified as Divus Aurelianus. There is substantial evidence that Aurelian's wife Ulpia Severina, who had been declared Augusta in 274, may have ruled the Empire by her own power for some time after his death. The sources indicate that there was an interregnum between Aurelian's death and the election of Marcus Claudius Tacitus as his successor. Additionally, some of Ulpia's coins appear to have been minted after Aurelian's death. Aurelian's short reign reunited a fragmented Empire while saving Rome from barbarian invasions that had reached Italy itself. His death prevented a full restoration of political stability and a lasting dynasty that could end the cycle of assassination of emperors and civil war that marked this period. Even so, he brought the Empire through a very critical period in its history and, without Aurelian, it may never have survived the invasions and fragmentation of the decade in which he reigned. Moreover, the Western half of the Empire would survive another two hundred years, while the East would last another millennium, and for that Aurelian must be allowed much of the credit. The city of Orléans in France is named after Aurelian. Originally named Cenabum, Aurelian rebuilt and renamed it Aurelianum or Aureliana Civitas ("city of Aurelian", cité d'Aurélien), which evolved into Orléans. ^ In Classical Latin, Aurelian's name would be inscribed as LVCIVS DOMITIVS AVRELIANVS AVGVSTVS. His full name, with honorific and victory titles, was Imperator Caesar Lucius Domitius Aurelianus Augustus, Germanicus Maximus, Gothicus Maximus, Parthicus Maximus, Restitutor Orientis, Restitutor Orbis. ^ Had Aurelian's family been enfranchised by virtue of the Constitutio Antoniniana (212 AD) his nomen would have been "Aurelius". ^ The tres militia were: (i) prefecture of a cohort of auxiliary infantry; (ii) tribunate of a legionary cohort; and (iii) prefecture of an ala of auxiliary cavalry. ^ Compare the career of Pertinax who pursued the Tres Militia with those of Publius Aelius Aelianus, Lucius Aurelius Marcianus (both probably) and Traianus Mucianus (certainly) who rose e caliga, i.e. through the ranks. ^ Later emperors Tacitus and Carus would mint coins with the legends XI or IA, signalling a 10% of silver in the alloy. ^ White 2015, p. 139. ^ Halsberghe, G.H. (1972). The Cult of Sol Invictus. Etudes préliminaires aux religions orientales dans l'Empire romain. Brill. p. 152. Retrieved 2018-04-13. ^ Saunders 1992, pp. 104-6. ^ a b Watson 1999, p. 1. ^ Saunders 1992, p. 107. ^ Saunders 1992, p. 109. ^ For instance, vita Divi Aureliani paras 5.5–6, 6.3–5, and 7.1–2. If he ever was a tribune of a legion as suggested in 7.1–2 it could not have been with Legio VII Gallicana as that unit never existed. ^ Saunders 1992, pp. 129–130. ^ Watson 1999, p. 41. ^ Aurelius Victor, xxxiii,21. Other sources do not cite Aurelian among those who conspired against Gallienus, though different sources have claimed that he was the one who called Gallienus out of his tent under a proposed "conspiracy" at that point Gallienus was stabbbed. ^ a b c Watson 1999. ^ a b c Körner, Christian (23 December 2008). "Aurelian (A.D. 270–275)". De Imperatoribus Romanis: An Online Encyclopedia of Roman Rulers and Their Families. Archived from the original on 2 December 2010. Retrieved 6 January 2011. ^ a b c Watson 1999, p. 42. ^ a b Watson 1999, p. 43. ^ a b Watson 1999, p. 44. ^ a b c d e Watson 1999, p. 45. ^ Watson 1999, p. 46. ^ a b c d Korner. ^ Zosimus, 1,48f. ; Eutropius; Dexippus, FGrH IIA 460 F7; Historia Augusta – Aurelianus xxi,1–3 and xviii,2. ^ Watson 1999, pp. 51–54, 217. ^ Watson 1999, pp. 54–55. 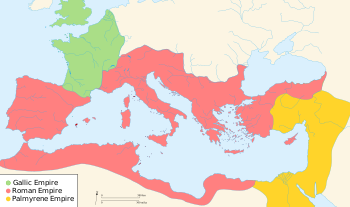 ^ The war against the Palmyrene Empire is described in Zosimus, 1,50,1–1,61,1, and Historia Augusta, Aurelianus, 22–31. Chisholm, Hugh, ed. (1911). "Aurelian" . Encyclopædia Britannica. 2 (11th ed.). Cambridge University Press. pp. 923–924. ^ Clauss, Manfred (2001). Die römischen Kaiser : 55 historische Portraits von Caesar bis Iustinian (in German). München: Beck. p. 250. ISBN 978-3-406-47288-6. ^ For example, in the Annales Cambriae, B & C Texts. ^ Watson 1999, pp. 52–53. ^ Watson 1999, p. 130. Saunders, Randall Titus (1992). A biography of the Emperor Aurelian (AD 270-275). Ann Arbor, Michigan: UMI Dissertation Services. Watson, Alaric (1999). Aurelian and the Third Century. Routledge. ISBN 0-415-07248-4. White, John (2015). The Roman Emperor Aurelian : Restorer of the World. Casemate Publishers and Book Distributors, LLC. ISBN 978-1-4738-4569-5. 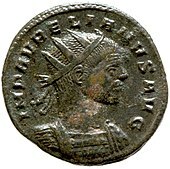 Wikimedia Commons has media related to Aurelianus.